These terms and conditions apply to the purchase of vouchers (“Vouchers”) from the Vouch for That website (www.vouchforthat.co.uk) which is used by individual hotels to sell gift vouchers online, operated by Vouch for That, having its principal place of business at Bellahouston Business Centre, 423 Paisley Road West, Glasgow, G51 1PZ. Please note that before placing an order, you will be asked to accept these terms and conditions. If you refuse to accept them, you will not be able to order any Vouchers on our website. Our shopping pages will guide you through the steps you need to take to place an order for Vouchers with us. You may only purchase and use a Voucher from our website subject to these terms and conditions. No other terms or conditions, including those which you seek to impose, shall apply. All images are for illustration purposes only and the actual colour and appearance of Vouchers may vary from the images on our website. If we are unable to supply you with a Voucher, we will inform you of this by e-mail and we will not process your order and will refund payment to you. We will issue the Voucher to you by e-mail or post as soon as reasonably possible after we have received your order and cleared funds from you in respect of the Voucher. The price of Vouchers will be as quoted on our website at the time you submit your order. We use our best efforts to ensure that prices of Vouchers are correct at the time when the relevant information was entered into the website. The price of Vouchers includes VAT (where applicable) at the applicable current rate chargeable in the UK for the time being. It is always possible that despite our best efforts, some of the Vouchers available on our website may be incorrectly priced. 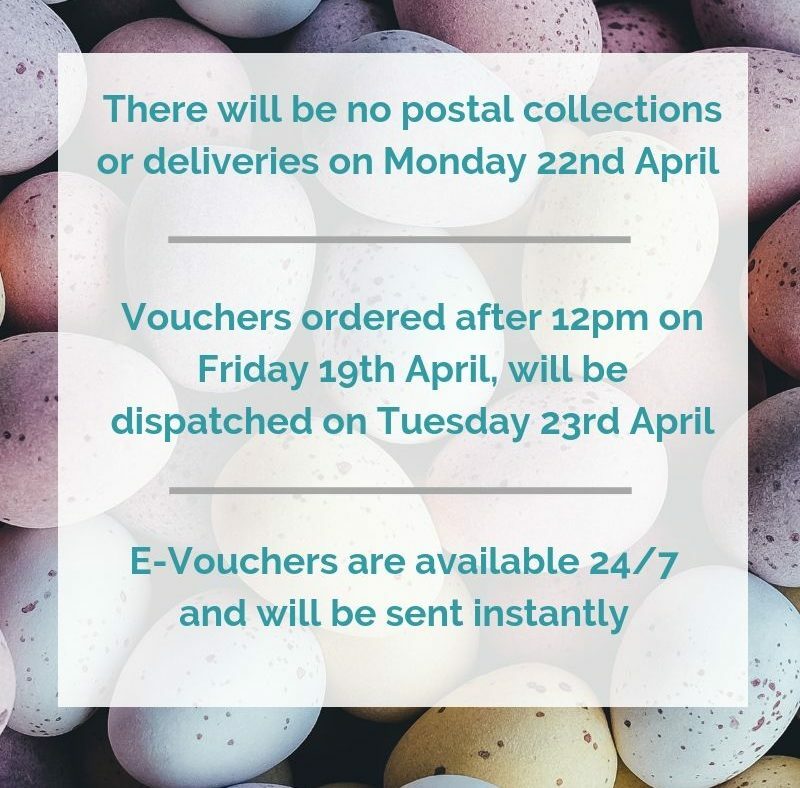 If we discover an error in the price of the Vouchers that you have ordered, we will contact you to inform you of this error and will give you the option of either continuing to purchase the Vouchers at the correct price or cancelling your order. We will not process your order until we have received your instructions. If we are unable to make contact with you, we will treat the order as cancelled and notify you in writing. There are no delivery charges for delivery of Vouchers to you. You can pay for Vouchers using a debit or credit card. We accept the following cards: Visa, Mastercard and American Express. Payment for Vouchers is in advance and we will not charge your debit or credit card until we dispatch your order. Risk of loss and title for the Voucher shall be transferred to you upon electronic transmission of the Voucher to you. You may only purchase Vouchers from our website if you are at least 18 years old. We reserve the right to ask you for proof of age before processing your order for Vouchers. We reserve the right to refuse to issue a Voucher to you at any time without the need to state the reason for any such refusal. A Voucher can be redeemed for period of between 6 and 12 months from the date of issue of the Voucher depending on which voucher has been purchased. The expiry date will be listed on the voucher. A Voucher presented for redemption after its expiry date will be treated as void and is non-exchangeable and non-refundable. You may only redeem a Voucher once as full or part payment against eligible purchases of goods and services from the participant organisations specified on our website from time to time. A valid Voucher must be submitted to the participant organisation upon redemption at that participant organisation’s place of business. You may cancel a Voucher up to 14 days after it has been transmitted to you without giving any reason. In order to cancel a Voucher, you must inform us of your decision to cancel by e-mail to the following address: hello@vouchforthat.co.uk. To meet the cancellation deadline, it is sufficient for you to send your e-mail containing your cancellation before the cancellation period has expired. If you cancel a Voucher, we will reimburse to you all payment received from you and cancel the Voucher. We will make the reimbursement to you without undue delay and not later than 14 days after the day on which we are informed about your decision to cancel the Voucher. We will make the reimbursement using the same means of payment as you used for the initial transaction, unless you have expressly agreed otherwise. In any event, you will not incur any fees as a result of the reimbursement and you do not need to return the cancelled Voucher to us – please destroy it. If you do not cancel a Voucher under condition 14, the Voucher will thereafter be non-refundable and non-exchangeable for any form of cash or credit alternative. You may transfer the Voucher to any third party as a personal or business gift without our consent but you may not use the Voucher in connection with any marketing, advertising or other promotional activities (including, without limitation, via websites, Internet advertisements, e-mail, telemarketing, direct mail, newspaper and magazine advertisements and radio and television broadcasts) without our prior written consent. You may not use any product image, corporate title, designation, service mark, trade mark, logo or any other trading name of Vouch for That or participant organisations without first having obtained our or their written consent. The use of a Voucher in any manner which states or implies, directly or indirectly, that you are endorsed or affiliated with Vouch for That is prohibited. If we fail to comply with these terms and conditions, we are responsible for loss or damage you suffer that is a foreseeable result of our breach of these terms and conditions or our negligence, but we are not responsible for any loss or damage that is not foreseeable. Loss or damage is foreseeable if it is an obvious consequence of our breach or of it was contemplated by you and us at the time we entered into these terms and conditions. We do not exclude our liability for: (a) death or personal injury caused by our negligence; (b) fraud or fraudulent misrepresentation; and (c) any breach of the terms implied by sections 13 to 15 of the Sale of Goods Act 1979. Please note these terms and conditions are governed by the law of Scotland. This means that a contract for the purchase of Vouchers through our website and any dispute or claim arising out of or in connection with it will be governed by the law of Scotland. You and we both agree that the courts of Scotland will have non-exclusive jurisdiction. However, if you are a resident of England and Wales or Northern Ireland, you may also bring proceedings in England and Wales or Northern Ireland, respectively. We may amend these terms and conditions from time to time by posting changes on this website. We will inform you of any such amendments where we are required to do so by law. These terms and conditions were last updated in April 2017.